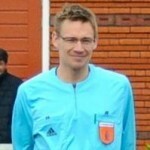 The Centre of Refereeing Excellence is a great experience for John Andrew Jones, because it helps him a lot as referee. 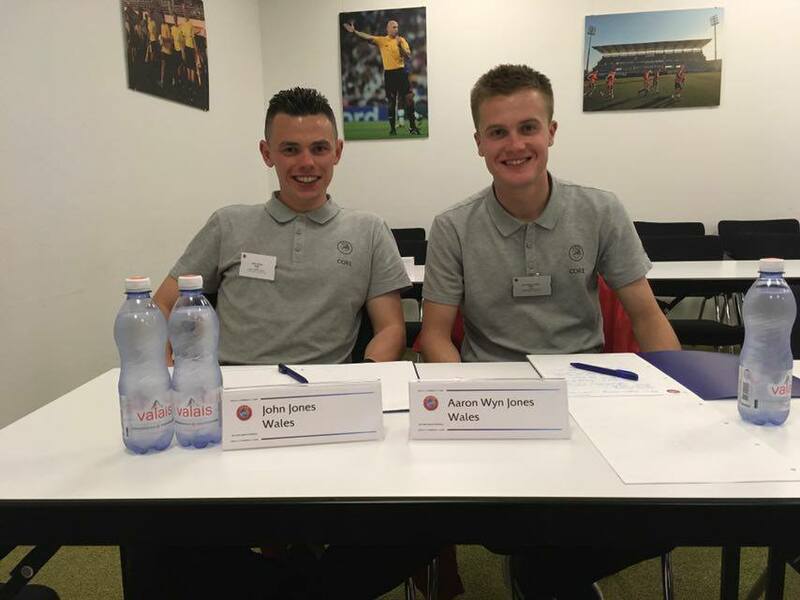 The Welsh (assistant) referee got his CORE diploma and gives you insights from his visit to the Uefa Headquarters. Congratulations with getting your CORE 36 diploma. How important is that for you? Thank you, Jan. It was an honour to represent Wales with Referee Rob Jenkins and Assistant Referee Aaron Wyn Jones as part of the CORE 36 team. I enjoyed my experience. And I would suggest that any referee who is lucky to be selected should take part if they wish to improve themselves for the better. 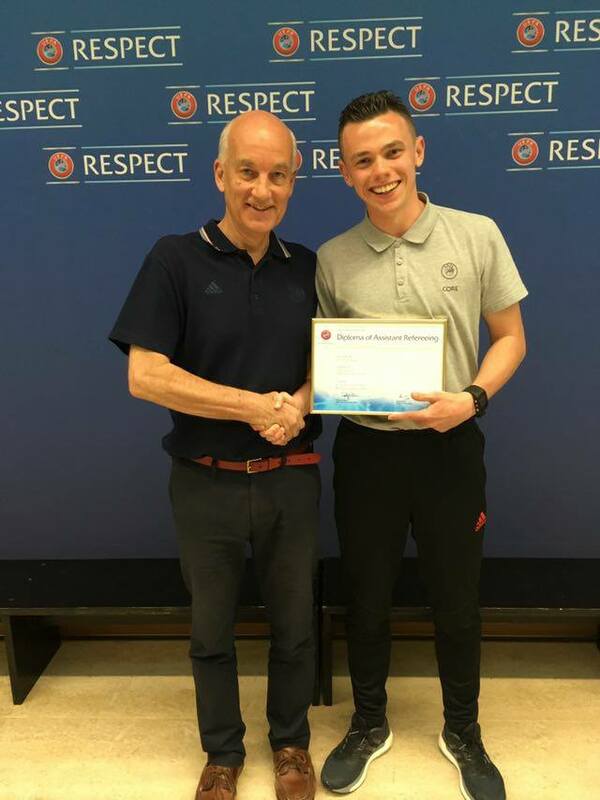 After all of my hard work, I was proud of myself for achieving the UEFA diploma and having the opportunity to meet and shake hands with CORE Senior Coach David Elleray. After five months of hard work between the Introductory and Consolidation course, it was a relief to know that I had achieved the goals set for me and improved beyond what I expected of myself. What are the requirements to pass the CORE training? The training is both physically and mentally demanding. The CORE course includes practical integrated training sessions and fitness specific sessions. The training sessions are filmed and analysis sessions take place inside a classroom. In regards to the Yo Yo test, the expected level is 18.2, which both my Welsh colleagues and I achieved at the Introductory course. At the consolidation course, the Yo Yo was a maximal test where I achieved 20.5. The Fitness plans and guidance provided by Dr Werner Helsen became an essential part of my preparation and enabled me to get into the best possible shape for the consolidation course. We received monthly fitness feedback, which analysed the quality of our training recorded via a polar watch. Back to the start of your career. Please introduce yourself as (assistant) referee. “I am 22 year old Primary School Teacher from Mold, North Wales. I began refereeing at the age of 13 and passed my LOTG exam at the age of 14. 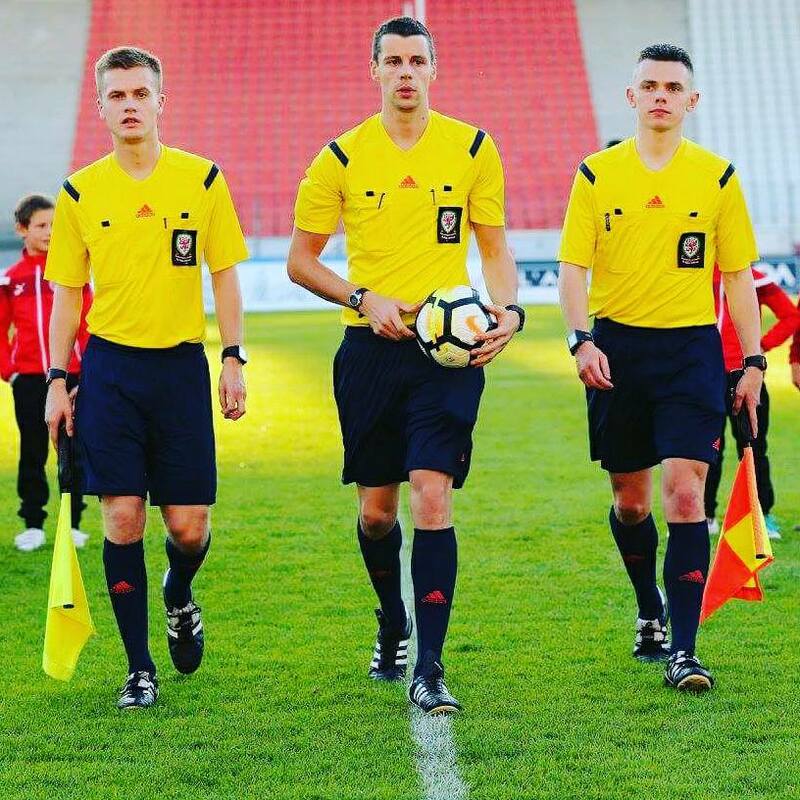 My career started with refereeing youth football on a Saturday morning, whilst acting as an Assistant Referee in the men’s leagues during a Saturday afternoon.” John Andrew Jones reaches the Welsh Premier League Assistants Panel (Tier 1) and Huws Gray Cymru Alliance Referee’s list at the age of 19. He has officiated as both a Referee and Assistant Referee respectively, because he got both roles. “In 2014, I refereed the FAW Women’s Cup Final and in 2016, I was Assistant Referee for Welsh Premier League Cup Final. I was also selected to take part in exchange visits to the Republic of Ireland (2015) and Northern Ireland (2017) as an assistant referee. Please tell me a bot more about your steps on the referee ladder so far. I am currently in my fourth season as a Welsh Premier League Assistant Referee and Huws Gray Alliance Referee. Prior to this, I received guidance from the former Referee’s Officer, Rodger Gifford, who provided me with lots of support and assistance over the years and promoted me to the Welsh Premier League Assistants panel. More recently, the Referee’s Manager, Ray Ellingham, and Assistant Referee’s Coach, Eddie King, have been instrumental in helping me to further develop as a match official and have always been happy to provide coaching, support and guidance. In regards to my selection to attend CORE, I believe that this was mainly down to my performances as an Assistant Referee at Welsh Premier League level. I also believe that my fitness levels and dedication to refereeing were a big factor in my selection. What are your most memorable moments from CORE? One of the best experiences at CORE was meeting referees from all over Europe. I have made lifelong friends by attending the course and I am still in regular contact with most of them. The Coaches were fantastic and continually encouraged us to analyse our performances to help us improve. The most memorable moment was meeting the Italian FIFA Referee, Nicola Rizzoli. I was speechless when he walked into the UEFA HQ auditorium as he is one of my refereeing role models and I had watched him for years on the television. Listening to his presentation was inspiring and a once in the life time experience. You’ve been to UEFA headquarters twice for the CORE program. What are the most important things you learn in these period? What are the difference between CORE and help at national level? And how important is the continuous help from a national FA to improve? It is important that national FA’s provide continuous help in order to inspire and guide others down a similar path. The coaching provided by the Welsh FA has been fantastic during my career as a match official. Every summer we attend a national Referee’s Conference in Cardiff for Wales’ Elite match officials. Flexibility and stability assessments were conducted during the introductory course. That happens to identify any areas which could lead to potential injuries. A specific training plan is then provided to address areas which need urgent attention. At the consolidations course, the overall flexibility is reassessed to establish what progress has been made. All officials are provided with a polar watch. Referees are expected to upload their HR and GPS data up to the TopSportsLab programme for evaluation. 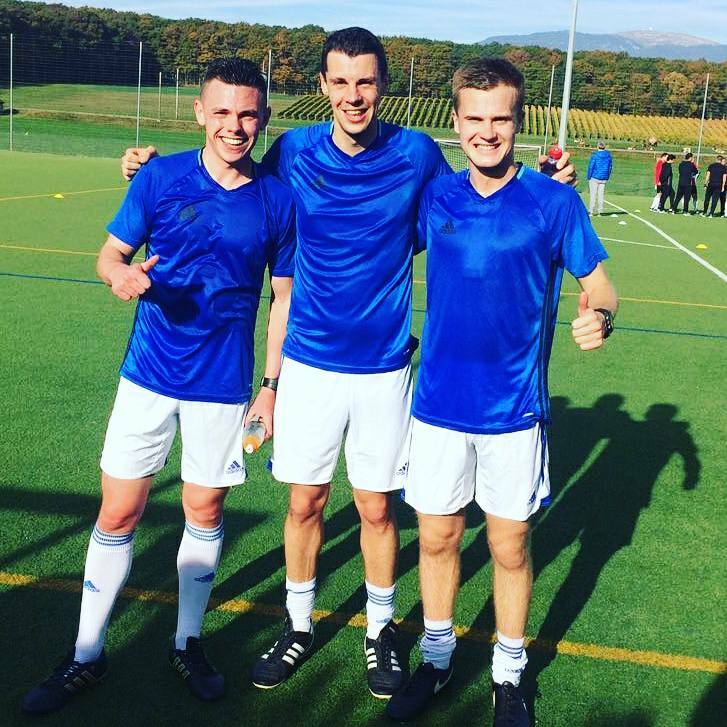 This is monitored over a 5 month period between the introductory course and consolidation and regular monthly feedback is provided by the fitness coach. Each official’s body fat and weight is measured at the introductory course and re assessed at the consolidation course. For example, my body fat during the introductory corset is 15:36% (Good). On my return to CORE, my body fat had reduced to 12.1% (Very Good) showing clear progress. “Each country is provided with a Referee and Assistant Referee coach, who provide monthly feedback to the trio. For CORE 36, our Referee coach was Nuno Castro (Portugal). The Assistant Referee coach was former World Cup Final Assistant Referee Leif Lindberg (Sweden). 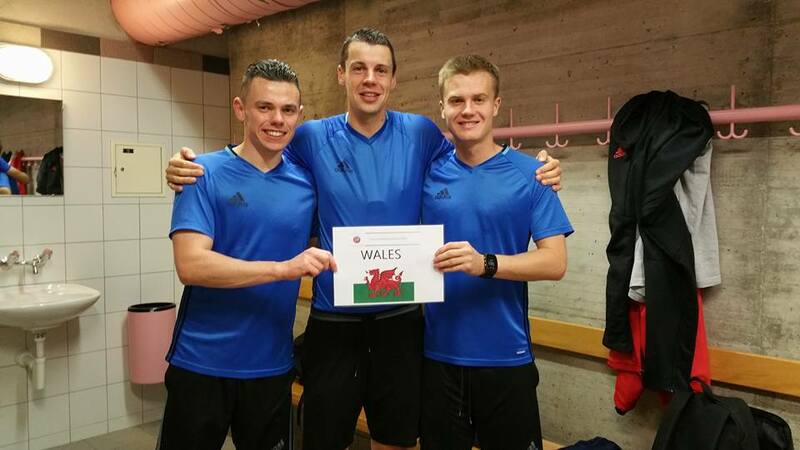 Our coaches provided technical feedback and analysed videos of domestic matches from Wales. This enabled us to constantly assess whether we were making the required progress needed to achieve our diploma. Following each match at CORE, no formal feedback is given until a detailed self analysis form is completed by the official. This enables the Referee/Assistant referee to critically reflect on the strengths in their performance and areas for improvement. Great take-away for us all: assess your own games, which is a great way to improve. What do you expect for the future as referee? What are your goals as referee? Have you ever mapped them out? Here are some tips for you as referee to set your goals as referee. Nice to hear that. How many African referees were there at that moment? We were 3 all from Ghana. We were participants of core 32. This has helped me alot in my refereeing carrier. Would like to know what is integrity training at CORE? That probably has to do with training the refs to be awere of match-fixing. Hi Nuraini, the Centre of Refereeing Excellence is education provided by Uefa and usually for European referees. Some African referees were particpating, but that’s usually not the case. Every association has their own programs, as has the AFC. Hi Jan, i hope you enjoyed Portugal, especially my town (Cascais). I’m a referee for a year and i’ve followed almost all your posts, what is excelent to learn a lot of “hide work” for our hobbie. I wonder how i could in the future participate in this centre. Thanks. Hi Vasco, I had an awesome time in Cascais. If you want to go to the Ibercup, you can check the website of Tournaments Abroad. 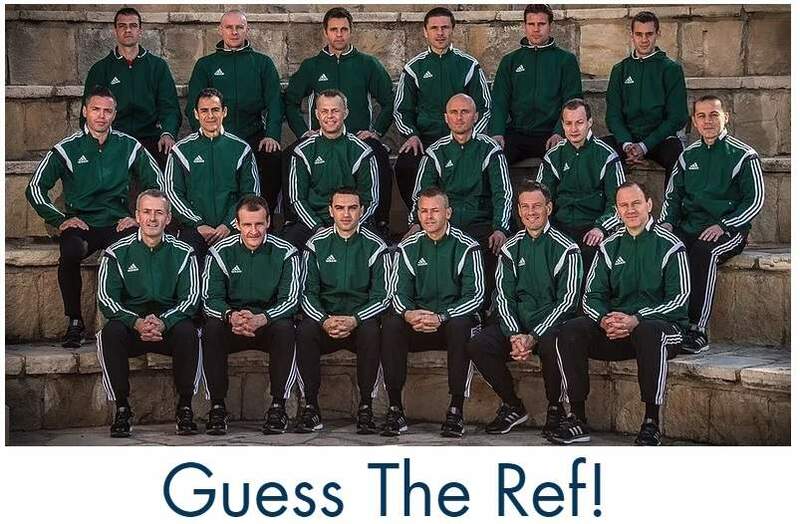 You comment now on the Centre of Refereeing Excellence post, which is something by Uefa and used for talented referees from all its nations.